Apolipoprotein C-III (apoC-III) is a small proinflammatory protein that may play a key role in diabetes pathophysiology. However, prior observational studies have been limited to predominantly white populations, and the biological links between apoC-III and diabetes, particularly the role of apoC-III on specific lipoprotein particles, are not yet well understood. We therefore investigated associations of total apoC-III and apoC-III-defined lipoprotein subspecies with incident diabetes and glucose metabolism measures in a multi-ethnic cohort. For the current analyses, baseline (2000–2002) plasma total apoC-III and apolipoprotein A-I concentrations of HDL containing or lacking apoC-III were newly measured via sandwich ELISA in 4579 participants from the Multi-Ethnic Study of Atherosclerosis. Multivariable Cox regression was used to examine associations of apolipoproteins with incident diabetes until early 2012 (567 cases), and linear mixed models were used to estimate associations with longitudinally assessed continuous measures of glucose metabolism. Similar exploratory analyses of plasma apolipoprotein B concentrations of LDL and VLDL containing or lacking apoC-III were performed in a subset of participants (LDL, n = 1545; VLDL, n = 1526). In the overall population, elevated total apoC-III concentrations were associated with a higher rate of diabetes (top vs bottom quintile, HR 1.88; 95% CI 1.42, 2.47; ptrend = 0.0002). 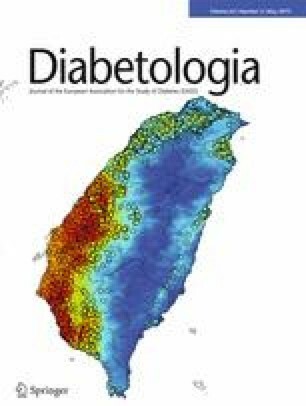 ApoC-III-defined HDL subspecies displayed opposing associations with incidence of diabetes (p for heterogeneity = 0.02). While HDL lacking apoC-III was inversely associated with incidence of diabetes (top vs bottom quintile, HR 0.66; 95% CI 0.46, 0.93; ptrend = 0.002), HDL containing apoC-III was not associated (HR 1.11; 95% CI 0.78, 1.58; ptrend = 0.61). Similarly, only HDL lacking apoC-III was beneficially associated with plasma glucose (ptrend = 0.003), HbA1c (ptrend = 0.04) and insulin sensitivity (ptrend < 0.0001), and higher HDL containing apoC-III was associated with lower insulin sensitivity (ptrend = 0.04). Neither of the apoC-III-defined LDL subspecies was associated with incident diabetes, while VLDL was more strongly associated with the incidence of diabetes when it lacked apoC-III. Further adjustment for plasma triacylglycerols as a potential intermediate attenuated the associations of total apoC-III and apoC-III-defined lipoprotein subspecies. No statistically significant differences were observed across racial/ethnic groups. Our findings in a multi-ethnic population support the involvement of apoC-III in the development of diabetes, potentially through its association with circulating triacylglycerols. The presence of apoC-III on HDL also diminished the protective association of HDL with incident diabetes. Further investigation of apoC-III and apoC-III-defined HDL subspecies may inform the development of novel diabetes treatment and prevention strategies. The online version of this article ( https://doi.org/10.1007/s00125-019-4847-8) contains peer-reviewed but unedited supplementary material, which is available to authorised users. The authors thank the MESA investigators, staff and participants for their valuable contributions. A full list of participating MESA investigators and institutions can be found at http://www.mesa-nhlbi.org. SAA drafted the manuscript, performed statistical analyses and interpreted the data with support from KJM and MKJ. JDF conducted the laboratory measurements, compiled the apolipoprotein dataset and drafted the ESM Methods. FMS and RLM provided valuable input on the study hypothesis and design, and FMS supervised laboratory measurements. MKJ conceived and designed the study and obtained funding for measures of HDL subspecies. MYT was involved in study design and data acquisition. All authors edited manuscript drafts, critically revised the manuscript for important intellectual content and gave final approval of the version to be published. MKJ is the guarantor of this work. MESA is a National Heart, Lung, and Blood Institute (NHLBI)-funded study supported by grants R01 HL071739 and R21 HL091217 from the NHLBI, T32 DK 007703 from the National Institute of Diabetes and Digestive and Kidney Diseases, UL1-TR-000040 and UL1-TR-001079 from the National Centre for Research Resources, and by contracts N01-HC-95159, N01-HC-95160, N01-HC-95161, N01-HC-95162, N01-HC-95163, N01-HC-95164, N01-HC-95165, N01-HC-95166, N01-HC-95167, N01-HC-95168 and N01-HC-95169 from the NHLBI. The present study was supported by the ADA (grant no. 1-15-JF-30) and HDL apoC-III measurements were supported by an independent research grant from Roche Pharmaceuticals and by the William F. Milton Fund, Harvard Medical School. Roche Pharmaceuticals provided unrestricted funding for the development of the novel apoA-I/apoC-III ELISA and had no role in the design of the study, data collection, analyses or report. Harvard University holds a patent for the measurement of HDL subspecies by apoC-III where MKJ, JDF and FMS are named co-inventors.